Kids and Bicycle Safety: Riding a bicycle can be fun, but it's important to follow safety guidelines so you don't get hurt while riding. Bicycle Safety: When you ride a bike, you are using a vehicle. This means that you need to obey the rules of the road. Bike Safety for Little Kids: Wearing a helmet is very important when you ride a bike because if you have an accident, you could have a serious head injury without a helmet. Bike and Wheeled Sports Safety (PDF): When you ride your bicycle, make sure that drivers can see you easily by using a light and wearing bright and reflective clothing. Bicycle Safety: What Every Parent Should Know (PDF): When you bike on a city street, you should bike with traffic, following the standard rules of the road. Bike Safety Tips (PDF): Knowing and using hand signals to show when you are turning right or left or slowing down will help motorists know what you are doing on your bicycle. Bicycle Safety for Children Ages One to Four Years: Many state laws require that kids under a certain age wear helmets when bicycling. A Safe Ride for Kids on Bikes (PDF): Don't ride on the street with your bike until you know how to operate and balance your bike and until you have the skills and judgment necessary to ride with traffic safely. Walking and Bicycling for Kids: Just because you see cars does not mean that the drivers see you. Assume that drivers don't see you, and always ride carefully, especially if you are in the road. Bicycle Safety (PDF): Common bicycle crashes involve riding out of a driveway and being hit by a car, running a stop sign and being hit by a car, not looking before you make a left turn, or being hit by a car that is pulling out of a driveway. Head Injuries and Bicycle Safety: Wearing a helmet that fits you properly will help you avoid a serious head injury if you ever have a bicycle accident. Getting Ready to Ride (PDF): When you ride a bike, you have transportation to get you where you need to go, and you are getting healthy exercise. Safe Bicycle Riding (PDF): Standard bike laws include riding with only one rider on a bike unless it is designed for two people and keeping both hands on the handlebars unless you are making a hand signal. Bicycle Safety: Before you get on your bike to ride, check it or ask an adult to check it to make sure the brakes, gears, and tires are in good condition. Bicycle Safety Tips: A head injury is the worst type of injury you could get from a bicycle accident, and it could cause permanent damage or even death. Bicycle Safety Quiz: Take this quiz to see if you know how to be a safe bike rider. Wear a Bicycle Helmet (PDF): Even if you ride your bike very carefully, you could still fall or have another type of accident that could injure your head seriously if you don't have a helmet on. Safe Routes for Kids (PDF): Complete these lessons and activities to learn how to be a safer bicyclist as you ride your bike around your neighborhood and city. Bicycle and Pedestrian Safety: If you have taillights and headlights on your bicycle, motorists will be able to see you more easily. Bicycle Safety: The ABC check of a bicycle involves checking tires for air, checking the brakes, and looking at the chain to make sure it is oiled and tight. Bike Safety: Biking can be a lot of fun, but you need to do it carefully to make sure that you stay safe. Teaching Children Bicycle Safety: Wear a helmet every time you ride your bike to make sure that you don't have a head injury if you have an accident. Bike Safety and Helmet Fitting for Kids: Your bicycle helmet should be snug and secure, fastened properly under your chin for the most protection. 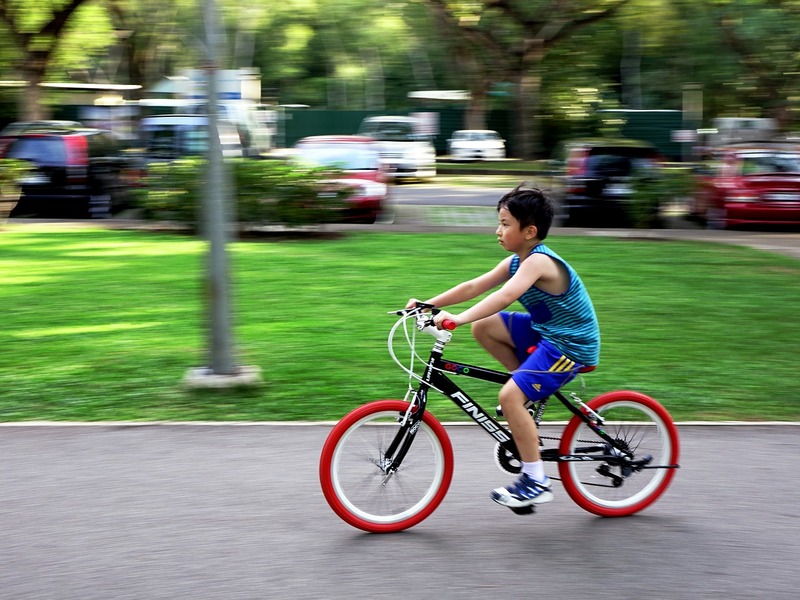 Teaching Children Bicycle Safety: When you are just starting to learn how to bicycle, don't ride on busy streets, and ride only during the daytime hours. Bicycle Safety: Myths and Facts: Some people think that a football helmet can also be used as a bicycle helmet, but this is not true. Bike Safety: Live to Bike Another Day: Make sure you know how to operate your bicycle before you start riding around cars. Bike Safety: As you try to get your 60 minutes of daily exercise in, you might ride your bike around your neighborhood. Bicycle Safety to Prevent Injuries: Choose your clothing carefully before you go biking to make sure that your clothing isn't so loose that it gets caught in the chain or spokes. Bicycle Safer Journey (video): Watch this video for tips on choosing and wearing a helmet and staying safe on your bicycle. Bike Safety: Understanding the Rules of the Road: When you bike on a bike trail, you may share the space with walkers and other bikers. Always ride on the right in a straight line. Bike Safety Fiction and Facts: It's important to wear a helmet every time you ride your bike, even if you are only biking for a very short distance. Kids and Bicycle Safety: Keep both hands on the handlebars. If you have things to carry, put them in a backpack or a bicycle carrier.